Arctic hare live in mountainous tundra, rocky plateaus and treeless coasts along the northernmost regions of Greenland, the Arctic Islands, Newfoundland and Labrador. Arctic hare are omnivores but their diet is 95% willow. During the summer, their diet includes dryas, grasses and other woody plants such as saxifrage, crowberry, and dwarf willow. 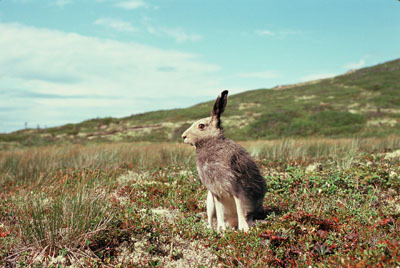 Arctic hare will also eat lichens, mosses, blooms, leaves, twigs and roots, mountain sorrel and seaweed. Arctic hare occasionally eat meat such as fish and opportunistically eat the stomach contents of carrion. 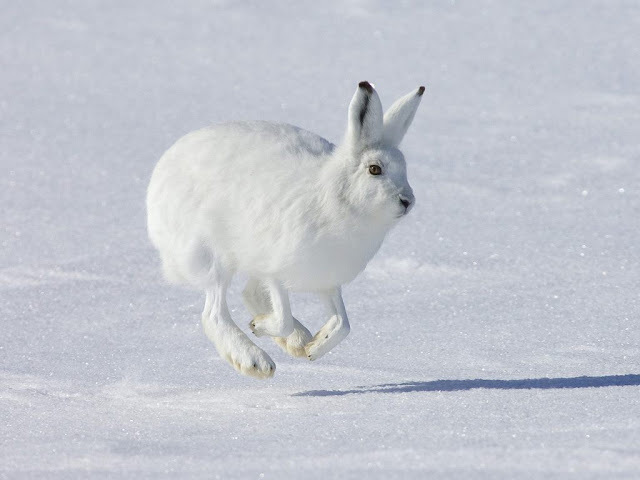 For hydration, Arctic hare eat snow. Arctic hare are nocturnal. They often gather in groups of 10-60 hares when they are feeding. In the northernmost parts of their range, they have been known to gather in groups of up to 300. Artic hare are the largest hare in North America and have cryptic coloration that allows them to avoid predators. During the winter, their white fur blends in with snow and acts as camouflage. During the spring and summer, their fur is a brownish-gray, which also blends in with the ground and surrounding habitat. When that does not work, running away at up to 30 mph just might! 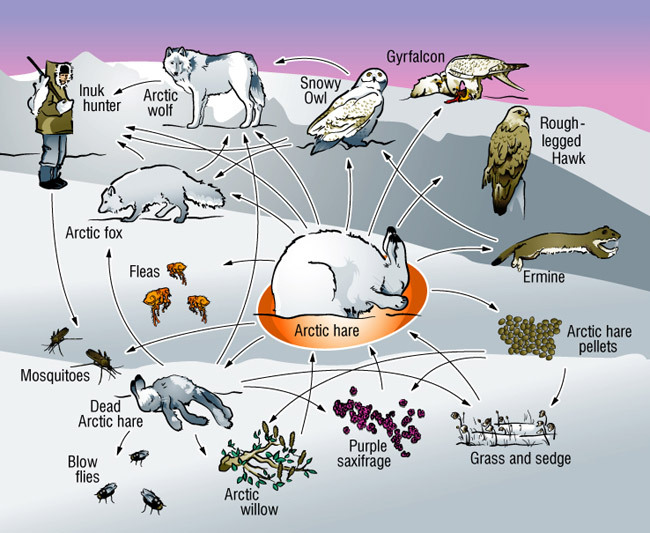 Arctic hare are an integral component of the food web as the following image illustrates. 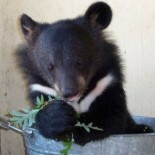 They are used by Eskimos for both food and clothing such as gloves and hats. The skin is used for blankets, stockings, pants, towels and in some cases, to plug rifle barrels. Eskimos utilize every part of the Arctic hare except the intestines. Some jurisdictions have seasonal limits on Arctic hare harvest. Hares and rabbits are both lagomorphs but there are some significant differences between them, which are explained nicely here http://www.diffen.com/difference/Hare_vs_Rabbit. I agree with your observation. The story of the Arctic hare is a reminder that so much in nature is not as we typically think of it. We associate bunnies with spring and warm weather. These bunnies thrive in the most frigid of conditions and are such an important food item, even in the dead of winter. Their absence would reverberate throughout the food web, a perfect example of the emphasis here at The Whisker Chronicles. This entry was posted on December 17, 2013 by Maymie Higgins in Arctic Animals, Mammals, Uncategorized.